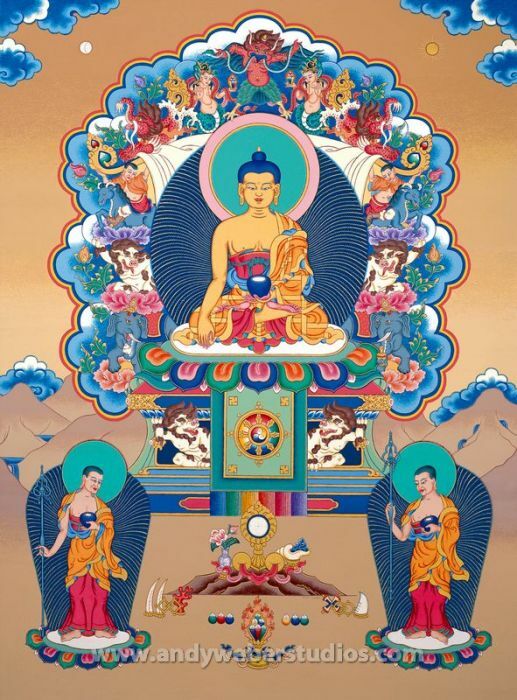 Buddha Shakyamuni and the six perfections of the enlightened mind, symbolized by the six fold ornaments. The elephant represents the perfection of generosity, the snowlion – the perfection of discipline, the young man riding the unicorn the - the perfection of patience, the crocodile Makara – the perfection of perseverance and effort, the nagas – the perfection of mediation and Garuda on top – the perfection of wisdom. Buddha Shakyamuni is sitting on the lion throne flanked by his two main disciples, on his right the foremost Svravaka disciple Shariputra and on his left Maudagalyayana renowned for the mastery of miraculous powers.